Don't have an account yet? Register now! Wonders of the inner world! Genetic diversity – A necessity and a consequence Diversity is a good thing because it gives people the chance to experience different things outside of what they are normally accustomed to. You and me are unique in our own way! May be "Space" is the final frontier, but human biology is more exciting and interesting as it helps us discover who we are and where we came from. Look around you and you will find each one of us to be different in some way or other; in fact we are different in more than billion different ways if we consider differences within us at the cellular level. There is no one else exactly like you. You could travel around the world but you still would never find another you – It's Only You! We deal with foods differently, respond to infection differently, respond to medicines differently, even our likes and dislikes differ too. Even though we are different from our parents in many ways we inherit genes from our parents. We can understand from our genome sequence that our DNA and associated genes define you, your appearance, physiology and behavior. Everything about our body, from eyes to the big toes, is the expression of genes. Thus, genes influence the traits you inherited in predictable and unpredictable ways. Emergence of different varieties or species The phenomenon of genetic diversity describes naturally occurring genetic differences among individuals of the same species. "Variation" is the term used in genetics, and refers to the emergence of different varieties, or species. This genetic phenomenon causes individuals or groups within a given species to possess different features from others. For example, all human beings on Earth possess essentially the same genetic information. But thanks to the genetic variation potential permitted by that genetic information, some people have blue eyes, or wavy hair, or long nose, beautiful skin, or short and stocky in stature. Genetic variation occurs mainly through sexual reproduction (meiosis, recombination/crossing over), independent assortment (random pattern of inheritance), Gene Flow (movement of genes from one population to another) and the very important DNA mutations. Due to the fact that environments are unstable, populations that are genetically variable will be able to adapt to changing situations better than those that do not contain genetic variation. Genetic variation permits flexibility and survival of a population in the face of changing environmental circumstances. It also describes naturally occurring genetic differences among individuals of the same species. Optimistically, genetic variation is often considered as an advantage, as it is a form of preparation for the unexpected. How bland and monotonous that would be without variation? Genetic variations bring spice to the life. The differences in the living forms, thought processes and emotions is what shaped us the way we are today and this is only due to genetic variation phenomenon. You probably have no trouble recognizing your friends in a crowd. 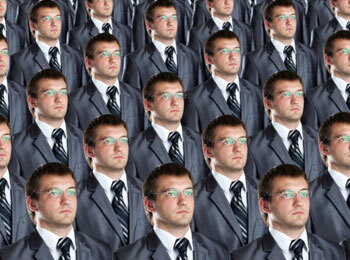 Each person has a unique genome, reflected in individual phenotypic variations such as appearance, voice, and temperament. Individual variation occurs in populations of all species and this is only due to diversity phenomenon. Variations arise either due to environmental influence or genetic factors. The environmental factors like the food, temperature, etc. influence the phenotype of individuals. However, phenotypic changes are not heritable. Genetic changes are those that affect the genes. These changes are heritable and important from the evolutionary point of view. Diversity is a good thing because it gives people the chance to experience different things outside of what they are normally accustomed to. For example, a diverse organization is one that values the difference in people. It is one that recognizes that people with different backgrounds, skills, attitudes and experiences bring fresh ideas and perceptions. Diverse organizations encourage and harness these differences to make their services relevant and approachable. Diverse organizations draw upon the widest possible range of views and experiences so it can listen to and meet the changing needs of its users. 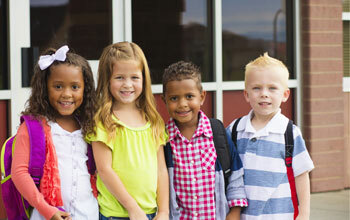 The encouragement of diversity benefits society. A characteristic of life on Earth is that it is full of variety We live in a world composed of various people, ideas, cultures, etc. Thanks to genetic diversity phenomenon that made variations possible. For example, African elephants height is approximately 13ft , 152 tree species in a single acre of tropical rain forest, gigantic trees, colorful birds, millions of brightly hued insects, and a variety of fascinating mammals – what spectacular variety we see among living things, both variation within kind and the staggering number of different kinds. Most of us are awed by the spectacular variation in form, color, size, features and function we see both within and among the incredible diversity of living things that grace our planet. Why so much variation? To the first scientists of the modern era, the answer seemed obvious. After all, we normally relate lavish use of color and form, precise variations on a theme, and prolific production with the work of master artists and craftsmen. If that is so, wouldn't we expect sumptuously rich beauty and abundance from the author of life, whose creative talents we so feebly reflect? Genetic diversity - To play survival for the fittest Usain Bolt - a Jamaican sprinter, widely regarded as the fastest person ever. Charles Darwin was aware of the evidence of creation. But what struck him more was the awful waste in nature, the continual struggle for survival that the over-abundant offspring of each kind faced in the competition for limited food and resources. Failing to understand this struggle for survival as the corruption of an originally harmonious created order, Darwin elevated the survival of the fittest to the place of Creator instead: ".... from the war of nature, from famine and death ... the production of higher animals directly follows." That is what Darwin wrote in summarizing his concept of the Origin of Species by Means of Natural Selection. For example; humans have undergone multiple adaptations to a wide range of disparate habitats, which let to the appraisal of different phenotypes. For decades, many observers of the Jamaican’s success story have guessed that they are dominant in distance races because they spend their childhood “training” by running/walking to school and working in the fields, climbing hills. American kids ride the school bus, watch TV after school hours, and struggle to keep up in major marathons. Thus, a genetically "healthy" population is defined as having a large amount of genetic variability. With a large amount of genetic variation, natural selection is able to operate by altering the frequency of particular "alleles" in response to environmental conditions. Alleles providing a survival benefit to a population increase in frequency while those producing a selective disadvantage decrease or are lost altogether from the population. Changes in DNA is the ultimate source of genetic variations Whether you’re looking at people, birds, or maple trees, diversity within population begins with DNA. Every bird in a flock or every fish in a pond may look the same to us, but just as no two people are exactly alike, individuals within all species vary. Every day we see people who vary in ways that are easy to see, like our shapes and sizes. We also vary in ways that are less obvious, like personality, susceptibility to disease, and ability to tolerate certain types of food. Individuals in other species differ from each other too, often even more so than humans. And whether you're looking at people, birds, or maple trees, diversity within population begins with DNA. Genetic variation can occur on several different levels, including changes to a specific gene, modifications of gene expression, and alterations in proteins. Genetic variations can range in size from macroscopic to sub-microscopic. They can take the form of gross structural changes in chromosomes, missing or extra genetic information, or minute errors in the spelling of the genetic code. Each type of genetic change requires a different technology for detection. Let's start finding out the reasons behind the genetic diversity. Exchange of genetic material during fertilization Reproductive cells called gametes transmit genes from one generation to the next through a process called fertilization during which male and female gametes unite. Sexual Reproduction cycle followed by genetic recombinationSexual reproduction involves the production of haploid gametes by meiosis. This is followed by fertilization and the formation of a diploid zygote. The number of chromosomes in a gamete is represented by the letter n. During meiosis, the chromosomes of each pair usually cross over to achieve homologous recombination. In sexual reproduction, the genetic material from two parents combines to form offspring which are genetically distinct from their parents (and are also distinct from other siblings produced by the same parents). Even though sexual reproduction requires more energy and time than asexual reproduction, it provides offspring with a unique genetic makeup that may provide them with a selective advantage in an unpredictable environment. The key to understanding how this genetic variation is maintained lies in examining the behavior of chromosomes during the sexual life cycle. Inheritance of traits such as color of eyes, skin and hair, facial features and overall physical appearance arises out of tens of thousands of genes we inherit from our parents. The coded information in the form of genes programs the specific traits that we inherit, and DNA contains this coded information of genes in the form of specific sequence of nucleotides. The sequence of coded words program cells to synthesize specific enzymes and other proteins whose cumulative action produces an organism's inherited traits. The programming of these traits in the form of DNA is one of the unifying themes of biology. The transmission of hereditary traits has its molecular basis in the precise replication of DNA, which produces copies of genes that can be passed along from parents to offspring. Reproductive cells called gametes transmit genes from one generation to the next through a process called fertilization during which male and female gametes unite. Sexual reproduction is the creation of a new organism by combining the genetic material of two organisms. There are two main processes during sexual reproduction; they are: meiosis, involving the halving of the number of chromosomes; and fertilization, involving the fusion of two gametes and the restoration of the original number of chromosomes. 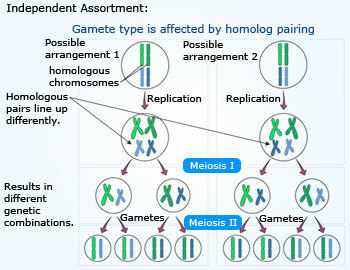 During meiosis, the chromosomes of each pair usually cross over to achieve homologous recombination. In the first stage of sexual reproduction, "meiosis", the number of chromosomes is reduced from a diploid number (2n) to a haploid number (n). During "fertilization", haploid gametes come together to form a diploid zygote and the original number of chromosomes (2n) is restored. Meiosis helps to generate improved variety Meiosis is important because it ensures genetic diversity in cells during reproduction. 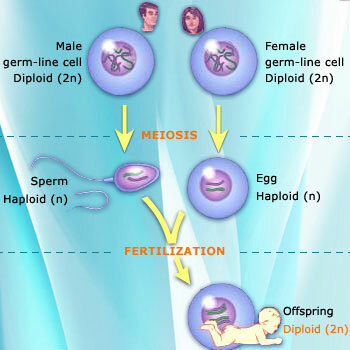 During fertilization, one "gamete" from each parent combines to form a "zygote". Because of recombination and independent assortment (one of the Mendel's laws) in meiosis, each gamete contains a different set of DNA. 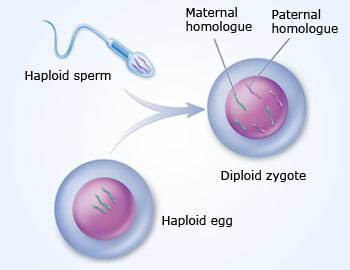 This produces a unique combination of genes in the resulting zygote. Meiosis also produces genetic variation by way of the process of recombination. Later, this variation is increased even further when two gametes unite during fertilization, thereby creating offspring with unique combinations of DNA. This constant mixing of parental DNA in sexual reproduction helps fuel the incredible diversity of life on Earth. Recombination and independent assortment allow for a greater diversity of genotypes in the population. Each of the homologous pairs of chromosomes may orient with either its maternal or paternal homologue closer to a given pole. Thus, there is a 50% chance that a particular daughter cell of meiosis it will get the maternal chromosome of a certain homologous pair and a 50% chance that it will receive the paternal chromosome. This reshuffling of genes into unique combinations increases the genetic variation in a population and explains the variation we see between siblings with the same parents.Thus, meiosis helps to generate improved variety, and results incredible diversity of life on Earth. Genetic recombination during chromosomal crossing over A process occurring during meiosis wherein two chromosomes pair up and exchange segments of their genetic material. This occurs at the stage when chromatids of homologous chromosomes pair up during synapsis, forming X-structure (chiasma). The chromatids break into segments (of matching regions), which are then exchanged with one another.Crossing over is important because it results in new combinations of genes that are different from either parent, contributing to genetic diversity. A second source of genetic variation during meiosis is the exchange of genetic material between the maternal and paternal chromosomes, a process called crossing over or recombination. Recombination occurs when two molecules of DNA exchange pieces of their genetic material with each other. One of the most notable examples of recombination takes place during meiosis (specifically, during prophase-I), when homologous chromosomes line up in pairs and swap segments of DNA. This process, also known as crossing over, creates gametes that contain new combinations of genes, which helps maximize the genetic diversity of any offspring that result from the eventual union of two gametes during sexual reproduction. It might be safely said that the crossing over process is more complex than anything man has ever designed. While the homologous chromosomes are paired together in prophase-I, pieces of one chromosome may be exchanged with the identical portion of the other chromosome. This means that the resulting chromosomes are not entirely maternal or paternal, but rather a mixture of both. 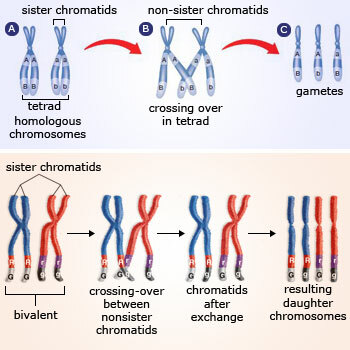 In humans, crossing over occurs about 2–3 times per chromosome pair, between non-sister chromatids only (not between sister chromatids). 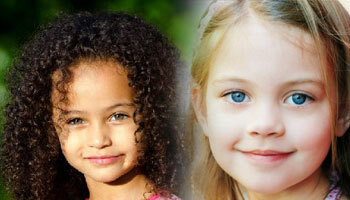 Genetic diversity or variation occurs because certain physical characteristics, like skin color, are variable; this variability is the result of alternate DNA sequences that code for the same physical characteristic. These sequences are commonly referred to as alleles. The various alleles associated with a specific trait are only slightly different from one another, and they are always found at the same location (or locus) within an organism's DNA. For example, no matter whether a person has fair skin, brown skin, or dusky skin, the alleles for skin color are found in the same area of the same chromosome in all humans. The unique combination of alleles that all sexually reproducing organisms receive from their parents is the direct result of recombination during meiosis. Thus, the important feature of meiosis is the exchange of chromosome pieces which occurs in the first division of this process (prophase-I), called recombination or crossing over. Recombination is a very significant source of genetic variation between individuals of sexually reproducing species, and the driving force for the process of natural selection. Independent assortment is the second way that meiosis produces genetic variability. Recombination is the formation of new allele combinations in a gamete. It results from two events in meiosis, independent assortment and crossing over. Independent assortment occurs in meiosis I when each pair of homologous chromosomes lines up on the metaphase plate. Each pair lines up independently of other pairs. In each pair the paternal chromosome may be on the left or right. The number of possible combinations of maternal and paternal chromosomes in the nuclei produced by meiosis equals 2 raised to the power of n, where n is the number of pairs of chromosomes. For the 23 pairs of human chromosomes this amounts to over 8 million combinations. Independent assortment is one kind of genetic recombination, one where the chromosomes supplied by one's parents are literally independently assorted into resulting gametes. Independent assortment is achieved when chromosomes line up in homologous pairs and move independently to the one pole or the other. The process is governed by complex enzyme systems which in turn must also have come about by chance. 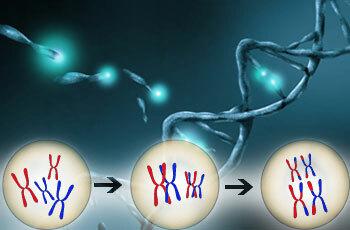 The possible variation that can be achieved by independent assortment depends on the number of chromosomes present. In humans, there are 46 chromosomes, which would arrange themselves in 23 homologous pairs. For example; If we inherit our parents 'genes', then why don't we look exactly like them? Let's try to answer this. If the complete 23 pairs inherit as it is to the child, he will look exactly like his father or mother, but what actually happens is – the genes randomly passes to the next generation. As a result, each brother and sister inherits a very different combination of chromosomes. From each parent, there are 223 possible combinations. There are thus 80 trillion possible variations. This is the reason, why siblings look different, hence the variation in one single family. If this is the case with single family, imagine the possible combinations and recombinations for the complete world – Unimaginable! Hence the incredible diversity. Thus, through sexual reproduction, genetic material is exchanged. This induces genetic recombination. 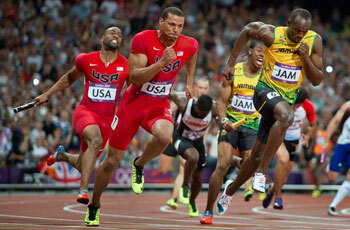 The significance of this is obvious: the exchange of material increases the variation. This holds particular advantages to populations and is considered by evolutionists to be an innovation that greatly enhances the evolutionary process. 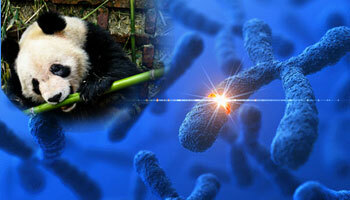 The riddle of the panda's thumb is one of the classic stories of evolution. An example of a helpful mutation would be the thumb of the panda. It is actually an enlarged wrist bone that helps them to grasp and eat bamboo, which is their main source of food. Mutations are the changes in DNA sequence. Mutations lead to genetic variation by producing random changes in an organism's genetic code. This causes a different protein to be produced, or none at all. Usually DNA mutations give a negative effect. This mainly results in not producing important proteins or enzymes. So the organism cannot do certain things (e.g not digesting fats, not having enough strength to fight against diseases etc). But sometimes DNA mutations lead to better variety of organisms. This is known as positive effect of DNA mutations. In this phenomenon, survival is more likely and the mutated (beneficial) gene is passed on to it&apos;s offspring. Many living things on Earth are here because of successful mutations, just as many have gone extinct due to harmful mutations. Over time, mutations occur (sometimes random) in order to assist a species to survive. An example of a helpful mutation would be the thumb of the panda. It is actually an enlarged wrist bone that helps them to grasp and eat bamboo, which is their main source of food. 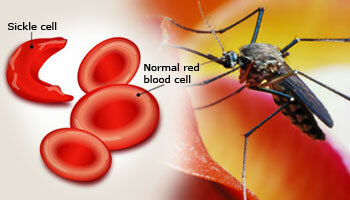 Individuals with Sickle Cell Anemia are immune to malaria. Sickle cell anemia is a genetic disease that causes red blood cells to be shaped like sickles while normal red blood cells are shaped more like a cylinder. Malaria works by going into the red blood cells until they burst. Because of the strange shape of the red blood cells in people who have sickle cell anemia, malaria can't enter in the cells that have the sickle trait, but it can enter in the others. This way, people with sickle cell wouldn't be as adversely effected then those without it. A positive effect of DNA mutations - Apolipoprotein AI-MilanoA small community in Italy is known to have a mutant version of this protein, named Apolipoprotein AI-Milano which removes cholesterol most effectively from the blood stream. Most random genetic changes are neutral, and some are harmful, but a few turn out to be positive improvements. These beneficial mutations are the raw material that may, in time, be taken up by natural selection and spread through the population. Let's list some examples of beneficial mutations that are known to exist in human beings. Sickle cell anemia: An example of a somewhat positive genetic mutation is Sickle Cell Anemia. Individuals with Sickle Cell Anemia are immune to malaria. The genetic damage to the blood cells make them inhospitable to the malaria virus. Sickle cell anemia is a genetic disease that causes red blood cells to be shaped like sickles while normal red blood cells are shaped more like a cylinder. Malaria works by going into the red blood cells until they burst. Because of the strange shape of the red blood cells in people who have sickle cell anemia, malaria can't enter in the cells that have the sickle trait, but it can enter in the others. This way, people with sickle cell wouldn't be as adversely effected then those without it. 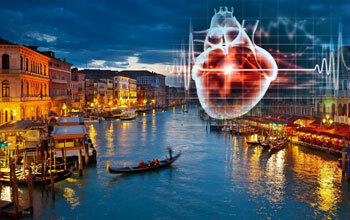 Apolipoprotein AI–Milano: Heart disease is one of the scourges of industrialized countries. It's the legacy of an evolutionary past which programmed us to crave energy–dense fats, once a rare and valuable source of calories, now a source of clogged arteries. But there's evidence that evolution has the potential to deal with it. All humans have a gene for a protein called Apolipoprotein AI, which is part of the system that transports cholesterol through the bloodstream. Apo–AI is one of the HDLs, already known to be beneficial because they remove cholesterol from artery walls. But a small community in Italy is known to have a mutant version of this protein, named Apolipoprotein AI-Milano, or Apo–AIM for short. Apo-AIM is even more effective than Apo–AI at removing cholesterol from cells and dissolving arterial plaques, and additionally functions as an antioxidant, preventing some of the damage from inflammation that normally occurs in arteriosclerosis. HIV's "main target" are CD4 immune cells In the acute stages of infection the virus destroys a lot of CD4 cells and produces many virus particles. In turn the immune system goes into overdrive to try and ward off infection. HIV virus is one of the most pressing health concerns facing the modern world. HIV is the virus that causes the syndrome AIDS, which stands for "acquired immune deficiency syndrome". Once infected with HIV a person can live many years without developing AIDS. After a person is infected with HIV, the virus seeks out the body's immune cells and attaches itself to them in the hopes of producing more virus particles. 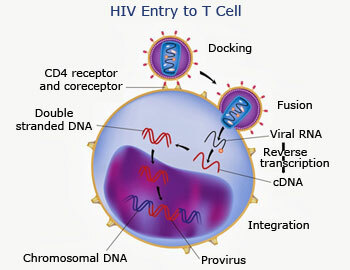 HIV's "main target" are CD4 immune cells. In the acute stages of infection the virus destroys a lot of CD4 cells and produces many virus particles. In turn the immune system goes into overdrive to try and ward off infection. When CD4+ T cell numbers decline below a critical level, cell-mediated immunity is lost, and the body becomes progressively more susceptible to opportunistic infections.After the acute stage the virus enters into a period of clinical latency that can last many years. During this time the virus is active but reproduces minimally.HIV infects vital cells in the human immune system such as helper T cells (specifically CD4+ T cells), macrophages, and dendritic cells mostly. CCR5-delta 32 mutation – Bringing revolution in HIV treatment A genetic mutation found mostly in people of European descent delays the progression of AIDS and in some cases even brings about immunity. A genetic mutation known as CCR5-delta 32 is responsible for the two types of HIV resistance that exist. 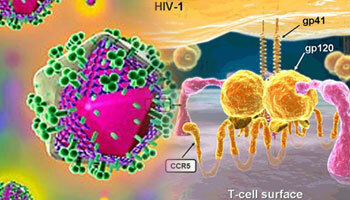 CCR5-delta 32 hampers HIV's ability to infiltrate immune cells. The mutation causes the CCR5 co-receptor on the outside of cells to develop smaller than usual and no longer sit outside of the cell. CCR5 co-receptor is like door that allows HIV entrance into the cell. The CCR5-delta 32 mutation in a sense locks "the door" which prevents HIV from entering into the cell. 1% of people descended from Northern Europeans, particularly Swedes, are immune to HIV infection. These lucky people are homozygous carriers of the mutated gene - meaning that they inherited a copy from both of their parents. Another 10 -15% (the number has even suggested to be18%) of people with European heritage inherited one copy of the gene. Just one copy of the mutation does not prevent against infection. It does however reduce carrier's chances of infection and delays the progress of AIDS. 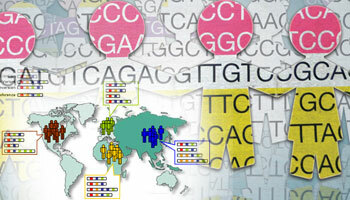 Since the CCR5-delta 32 is tied primarily to the Eurasia region, the mutation has not been found in Africans, East Asians, or Amerindians. Genetic variation is useful as it helps populations change over time By having different genetic combinations, individuals of a population exhibit different traits which may or may not be to their benefit in regards to social and environmental interactions. Thus, genetic variation is useful because it helps populations change over time. Variations that help an organism survive and reproduce are passed on to the next generation. Variations that hinder survival and reproduction are eliminated from the population. This process of natural selection can lead to significant changes in the appearance, behavior, or physiology of individuals in a population, in just a few generations. It can provide resistance to diseases or other beneficial characteristics. This allows the species overall to constantly reproduce the beneficial traits and flourish. Copyright © 2018 Wiki Kids Ltd.